How Do You Report on Something That Isn't True? Dealing with Donald Trump’s tweets and other fake news. How do you report on something that isn’t true? How do you report rumours or baseless allegations? Should you ignore them completely or is the job of journalism to bust myths and correct misinformation? This is a grave problem. Social media is wonderful because it gives everyone access to the Internet in a way that allows us all a voice, not just the small cadre of people who work in ‘mainstream media’. But it also means that you can make allegations or start rumours without evidence. With some luck or cunning these can spread quickly. There is some good research from people like Jonathan Albright at Elon University to show that this can be accelerated deliberately by propagandists or commercially-driven fake news websites. This was a problem during the UK referendum (and in its aftermath) as well as the US presidential election (and its aftermath) but as my recent report for Columbia journalism school showed, it is also a critical problem in the reporting of terror incidents. This is now part of the ecology of networked journalism. Of course, we should start by accepting that mainstream media has also been at fault in making allegations or starting rumours by itself. 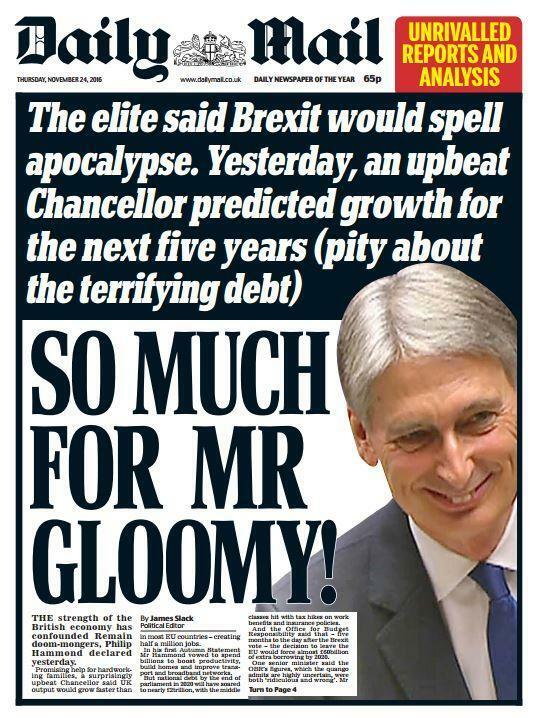 In the UK we have newspapers who frame their reporting in such a partisan way that you can get almost diametrically opposed versions of the same ‘facts’. 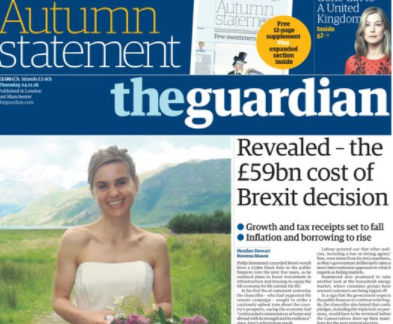 Compare the reporting of the British government’s Autumn Statement on the nation’s finances in the Daily Mail and the Guardian, for example. Same event, quite different perspectives. The journalists selected facts and arranged them differently to tell quite opposed stories about the nation’s finances and economic prospects. In that sense, you pay your money and you takes your ideological choice. If you wanted a more conventionally ‘balanced’ account, you could go to the BBC. Yet, all these versions were based on evidence with accompanying analysis and commentary that makes the case explicitly. This is not the case with the kind of fake news and propaganda that is being generated by some alternative online ‘news’ sources. These are significant sources of bad information. Worse still, politicians and activists are happy to exploit the public desire for sensational conspiracy and fantasy narratives. 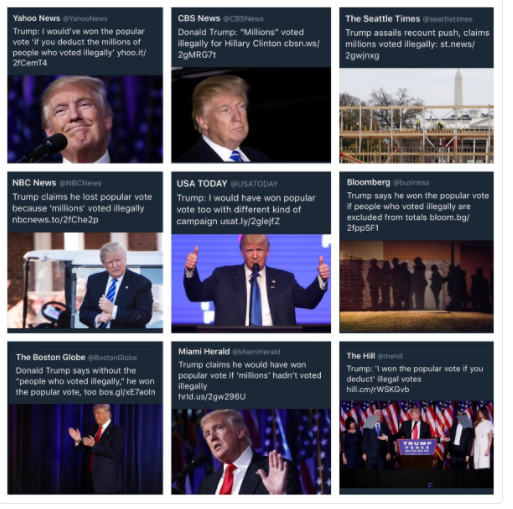 There is now a president-elect in the US who recycles some of them on his twitter feed. The public notice them. They have influence. So, what should journalists do when these unsubstantiated narratives start getting traction online? Fortune media writer Matthew Ingram points out that dealing with this is made harder when mainstream news journalists have to respond on social media. Do you retweet a tweet that you think is not based on facts? You only have 140 characters to both note the original and make some kind of critical appraisal. And even with the luxury of a longer form online or newspaper article, do you give those tweets the same credibility as, say, a statement from a White House spokesperson or a ‘real life’ sound bite or speech by the politician themselves? NYU professor Jay Rosen has dealt with this in the context of the ‘false balance’ debate. It’s not good enough, he argues, to simply say that you are reporting what someone is saying and then reporting that someone else says it’s not true. If done in a traditional ‘impartial’ way that simply gives a false equivalence between the baseless assertion and a news story based on facts. Even if someone is giving an opinion, their assumptions must be challenged if their argument is based on false premises. The BBC struggled valiantly to cope with this problem during the referendum campaign but with hindsight many journalists there feel they should have been bolder. As I wrote in my article about coverage of the US election, The New York Times shifted its approach in the last phase of the US election campaign and started to call out Donald Trump’s lies. 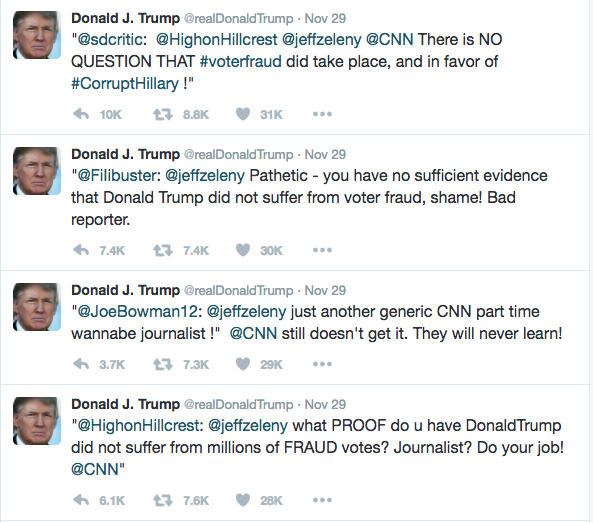 They are trying to keep up that critical approach to the president-elect’s tweets, but when he’s in the White House how can you avoid covering his fact-light stream of consciousness? I think the solution is three-fold (at least!). Firstly, news journalism has to be much more explicit about whether the statements they report are evidence-based. The excellent fact-checking that we are seeing has to be incorporated into the first paragraph and headlines, not just left for a side column or footnote. Journalists have to subject their work to a degree of rigour that was not thought necessary in the past. Instead of clinging to outmoded concepts of objectivity, they must be pro-active agents of veracity. BuzzFeed gets a lot of traffic for its regular social media myth-busting. If they can’t do it themselves, then journalists should look for help from experts like First Draft or Snopes. Secondly, we need to use algorithms, data-mining and network analysis like this to identify not just the sources of fake news such as those famous Macedonian teenagers, but also the way that platforms and other networks allow them to spread. Just because something has gone viral doesn’t mean it is real. Thirdly, mainstream news media needs to get much better at transparency about its own work. If it has rigour and authority then it should start to embrace what Frederic Filou calls the ‘signals of quality’. The hope is that building a quality-scoring apparatus for news content can give a kind of embedded kitemark of editorial value. That will help networks and platforms as well as search (and, therefore, the reader) to identify evidence-based, critical, independent journalism. With a bit of luck, subscribers and advertisers will value that, too. Countering this kind of rampant relativism is a job that ‘good’ journalism should relish. But it can’t do it alone. The platforms and networks must take some responsibility, too. It would help if other public organisations such as corporations and politicians understood that a breakdown in public trust in the idea of ‘good’ information is bad for them, too. The mainstream media has been pretty complacent in the past at recognising that trust is the currency of journalism in the digital age. The US media is not yet getting the response to Trump all right by any means. So perhaps it’s not surprising that public trust levels are at record lows and audience figures are sliding. Getting this right is vital for democracy but it’s also essential if mainstream media organisations want the public to value their work and support it in the future. I’m about to head off to the States for two weeks research looking at new innovative projects that are seeking to build trust, verification and relevance into new forms of journalism. There’s a lot of innovative work going on and it’s going to be fascinating to see if it can stem the rising tide of bad information, fake news and propaganda. Charlie Beckett is a professor in the Department of Media and Communications at the LSE and director of Polis, the LSE’s journalism think-tank, where this article originally appeared.